Winger Rupeni Caucaunibuca has been banned from playing for Fiji for a year after he failed to appear at several internationals earlier this season. 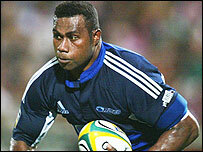 Caucaunibuca, 25, missed matches against Samoa and Tonga, as well as a 91-0 loss to New Zealand on 10 July. The Fiji Rugby Union imposed the ban, ruling him out of this autumn's tour of Europe and next season's South Pacific Tri-Nations series. He remains available for his French club side Agen. Caucaunibuca returned to Fiji from France in late May to prepare for games against New Zealand Maori and the All Blacks and in time for Fiji's World Cup qualifiers, but failed to appear in any of the June or July matches. The French-based player missed Fiji's first World Cup qualifying match against Tonga in Suva but was recalled for their subsequent match against Samoa. After assuring Fiji coach Wayne Pivac he would play, Caucaunibuca missed a flight to Samoa saying he had been forced to remain in Fiji with his wife who had an infected tooth.